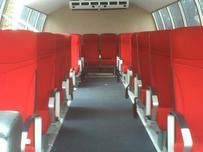 Weight: 1,800 kg empty, Payload: 900 kg max, Length: 7.3m, Width: 3.5m, Height: 2.2m, Cushion Height: 0.45m (hard structure clearance), Seating: 12 passengers, Power Unit: Toyota 4.0L V8, Optional; Cummings 600 Turbo Diesel, Transmission: Gates Polychain GT toothed drive belts - quiet and efficient with a long operation life. Propulsion: Three blade wide chord carbon-fibre propeller. Low revolutions and quiet with fully reversing pitch control. Lift Fan: High flow aerofoil section composite centrifugal fan, Flexible Skirt: Full flow PVC/nylon reinforced loop with anti-bounce web. Reinforced neoprene segments. 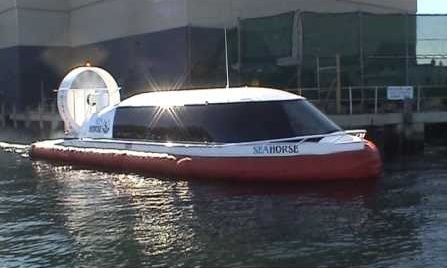 Wave Height: 1.0m, Speed: 35 knots, Fuel Capacity: 240 litres, Fuel: 91 octane petrol, Consumption: 25 litres an hour average. Oceans cover 71% of the surface of the Earth or 360 million square kilometers. The ocean is on average, 4 kilometers deep. The deepest point is the Mariana Trench at 11.7 kilometers deep. 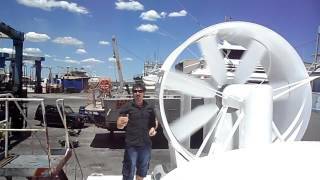 Hovercraft are classified as marine craft and are built to IMO specifications, surveyed by Det Norskje Veritas (DNV) , American Bureau of Shipping (ABS), Germanischer Lloyd (GL) or Commonwealth of Australia Marine Survey or surveyor of your choice. NB: Survey is not required for private pleasure craft. 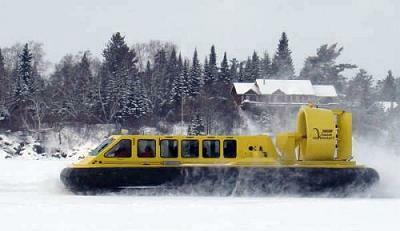 Pacific Hovercraft New Zealand Ltd. produces some of the worlds most advanced hovercraft. The “Slider” personal hovercraft in the “XLS” variant [see left] could be used by lifeguards for water rescue. 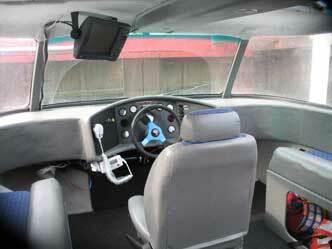 They produce the 7 passenger “Discovery”, 12 passenger “Explorer”, a 25 –50 passenger "Odyssey". In addition Production of heavy equipment transport are also produced. because some bureaucrat was too short sided in an budget assessment regarding the purchase of essential emergency equipment. Futurevision International created a re-design for a Search & Rescue version [code named] “Guardian’ and a Military/ Homeland Security Gunship version [code named] “Orca”.​The upgrades include: Marine Grade Aluminum hull, KEVLAR composite upper hull , where applicable GE LEXAN bullet resistant laminates, permanently inflated flotation collar, the addition of two Dillon Aero M-134DT Electric Mini Gatling Guns will turn this craft into a real “Killer Whale”. 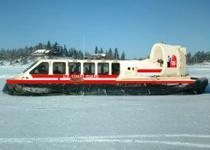 Vanair Hovercraft Canada produces the V-18 “Vanguard” 18 passenger hovercraft for Law Enforcement, Search & Rescue, Water Taxi and Personal Watercraft. In addition to this craft they produce the V-9 “Vixen” 9 passenger. Production of heavy equipment transports and other commercial applications are also available. Hull & Super Structure: Aluminum – Length: 36' 4 in / 11.05M, Width side structures on; 14' 5"/ 4.41M, side structures off: 8' 5"/ 2.59 M, Height off cushion: 10' 2"/ 3.10 M, Max Gross Weight: 15,200 lbs/ 6909 KG, Max Payload: 6000 lbs/ 2727 KG, Obstacle Clearance: 18"/ 0.45M, Fuel Capacity: 60 GAL/ 271 LT, Engine: Cummins Diesel 350 HP, Seating Capacity w/Operator: 19, Cruise Speed on water: 35 mph/ 56 kph, Fuel Consumption with full payload: 7.3 gal/hr/ 33 litres/hr, Endurance: 8 Hrs, Max Operating Wave Height with full payload: 39 inches/ 1 Meter, Braking: Full Reversing Propeller, Pitch & Trim Control: Elevators, Skirt System: Loop & Segment. 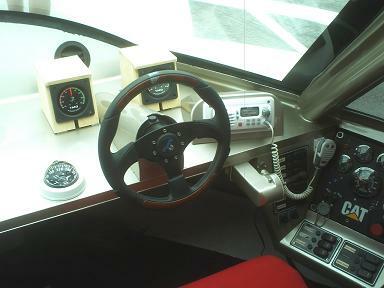 Shadow System Saerch & Rescue Package: Remote Spotlight, Air Conditioning, Communications: FURUNO Weather Radar,  KVH Tracphone 252 Inmarsat Mini-M Satellite Telephone System. Emergency Power & Lighting:  Vector 3000 Watt DC/ AC Power Inverters power supplies, Vector Spotlite 2,000,000 candle cordless spotlight. Water Operations:  Plastimo- Offshore 8 Passenger Life Rafts [mounted  per side], Stay Alive or OTE [Coast Guard Approved] Life Vests. SAR Operations: Streamlight Sidewinder Tactical LED/ IR Flashlights, ACR MS-2000 Combat Search & Rescue Strobes. First Aid:  BLS Trauma Kit, First Responder First Aid Kit. Fire Safety: [2 Each] Amerex 10lb. Carbon Dioxide & [2 Each] Kidde Pro Line 20lb. ABC & 10lb. ABC Fire Extinguishers. 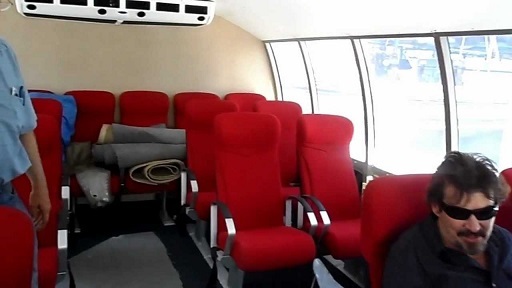 Another "Outside The Box Solution" was produced by INCAT of Australia. 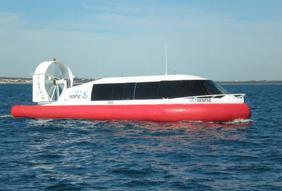 When you hear the words Wave Piercing Catamaran only one product comes to mind the INCAT. 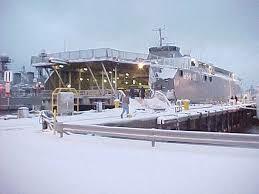 Originally producing people and truck ferries they hold the worlds record as the fastest ocean going ships. With movable decks and the ability to traverse low tidal basins without tug boat assist has made the INCAT the most sought ship for inter-island transport. 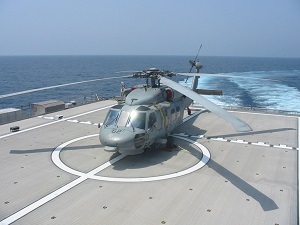 Working with the “Joint Venture Project” three ships were outfitted to carry troops and a variety of support equipment. The goal: test the “Rapid Mobility” of these ships. 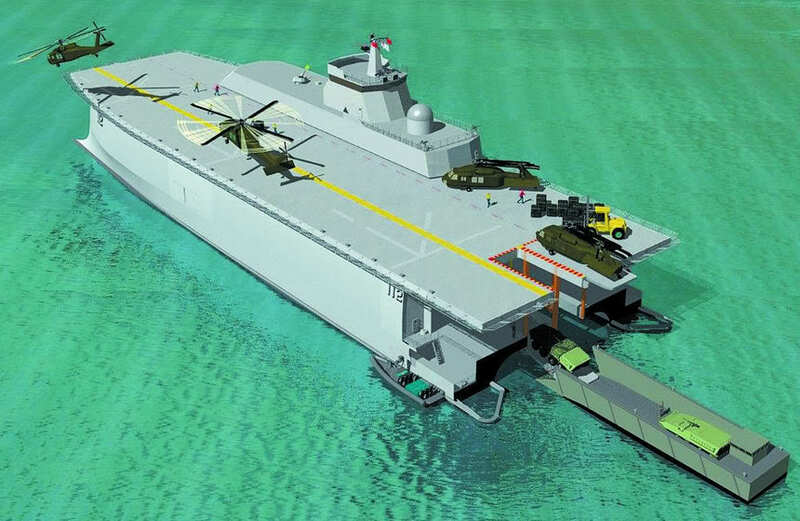 Production of flexible configurations from 74 meters to 110 meters in length allows for a variety military options. The unlimited potential and applications of the INCAT is beyond futuristic. 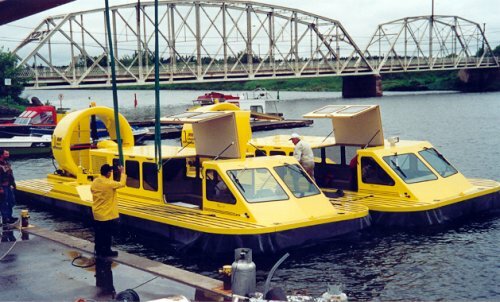 The “Velocity 30” hovercraft is intended for commercial use carrying passengers as water taxi, sightseeing, or for resort transportation. 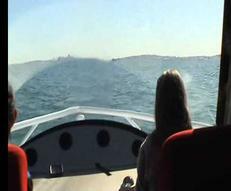 Sea trials have beeN completed. Range; 300NM, Engine: Caterpillar C9 375HP Diesel, Cruise Speed: 35 knots., Max Speed: 70 knots, Sea State: up to Force 6, Length: 14.45 meters, Beam: 5 meters, Cabin Height: 2 meters and an 800 rpm “Pitch in Motion” low noise propeller.